Deep in a forsaken wood, a wild man keeps watch over a golden spring. 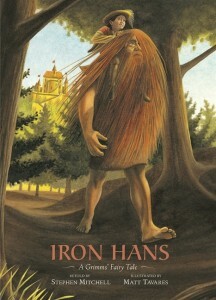 Iron Hans is nine feet tall, as brown as rust, with hair to his knees. He is cursed, a terror to all, until a prince finds the courage to befriend him. But when he betrays Iron Hans’s trust, the prince must make his way in the world alone, penniless and unknown—except for, in the end, a little help from a certain forgiving wild man. Stephen Mitchell’s deft retelling and Matt Tavares’s elegant illustrations gracefully unfold this Grimms’ tale about pride and humility, wealth and poverty, and the importance of doing good—whether you are a servant or a prince, a wild man or a king. Once upon a time, there was a king who had a large forest near his palace, and in this forest there were all kinds of wild animals. One day he sent out a huntsman to shoot a deer, but the huntsman didn’t come back. “Maybe he had an accident,” the king said, so he sent out two more huntsmen to look for him, but they didn’t come back either. On the third day, he sent for all his huntsmen and said, “Search the whole forest, and don’t stop until you’ve found them.” But none of the men came back, and of the many dogs they had taken with them, not one was ever seen again. From that time on, no one dared to go into the forest. It lay there in deep stillness and solitude, and no one saw any of its creatures except for an eagle or a hawk now and then flying over it. Things went on like this for many years. So the huntsman took his dog and went into the forest. Soon the dog picked up the scent of some animal and began to follow it, but after it had run a few steps it came to a deep pool and stopped. A large bare arm rose out of the water, grabbed the dog, and pulled it under. The huntsman was appalled; it was his favorite dog, and he loved it very much. But he had a job to do, and he was determined to do it. “There is a huge, dangerous man at the bottom of the pool,” he thought. “He can breathe underwater, and it will be hard to capture him by diving in. The only sensible way is to drain the pool.” So he hurried off and brought back thirty men with buckets. They worked for three days, and when they got close to the bottom, they found a wild man sitting there. He was nine feet tall, his body was brown like rusty iron, and his hair hung over his face down to his knees. The other men were terrified, but the huntsman didn’t hesitate: he took a lasso, threw it over the wild man, pulled it tight, and then commanded the others to bind the man’s hands and feet. The wild man didn’t resist; he seemed almost glad to be captured. They carried the wild man to the palace. Everyone was astonished. He was so huge and strange-looking that no one except the huntsman dared to get near him. The king commanded that he be locked in an iron cage in the palace courtyard. No one was allowed to open the door of the cage upon pain of death, and the key to it was entrusted to the queen herself. From that day on, it was safe to go into the forest. The king had a son who was eight years old. One day, while he was playing in the courtyard, his golden ball rolled into the cage. The boy ran over and, frightened as he was, shouted into the cage, “Give me my ball!” This was the first time anyone had spoken to the wild man. “No,” said the boy. “I won’t do that; the king has forbidden it.” And he ran away. “Who put you under the spell?” asked the boy. The boy thought about this conversation all day. He grew more and more fascinated with the wild man, and less and less afraid of him. The boy was excited and terrified. Could he actually break his father’s rules, betray his mother, and steal the key? By now the desire to let the wild man out of his cage was so strong that he knew he had to continue, even if he was caught in the act. He crept up to the queen’s bedroom, took the key from beneath her pillow, and ran down the winding stairs as fast as he could. By the time he reached the cage, he could barely breathe. He had a difficult time opening the door, and as he was pressing down on the key, he cut his finger. Finally the door opened, and the wild man stepped out, gave him the golden ball, and quickly began to walk away. The boy yelled, “Wait! Please, wild man, don’t go! Wait for me!” The wild man looked over his shoulder and turned back. “Take me with you, please!” said the boy.